If you’re in the middle of Uptown Charlotte looking at the shimmering glass and steel, it’s easy to forget that Charlotte dates back to the 1760s. With a city that's over 250 years old, there's plenty of history—and plenty of locations rumored to be haunted by the ghosts of the Queen City's past. Many “haunted” sites are just local folklore with a bit of history thrown in as the starting point, but when multiple people over multiple time periods have consistent stories, there may be something to these ghost stories. 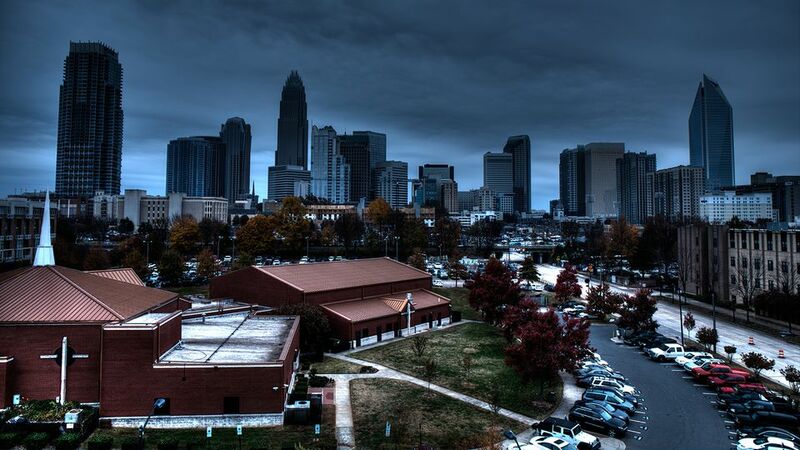 With over 10 haunted sites to choose from, Charlotte has become known as one of the most spirited places in the United States. There are several other sites with “ghost stories” of their own, but these are well-known places that have multiple claims of the same sighting. If you’re actually looking to see a ghost though, you’d probably be better off heading to a haunted house during the fall, or a local costume shop. Even if you check out every place on this list, there’s no guarantee you’d see anything, but just because you didn’t see anything on one visit, that doesn’t mean there’s no activity. This historic site is best seen at sunset since you can't really explore the ruins of the building any time of day. Although just the outside shell remains today, the Carolina Theater still holds its share of stories since its original construction in 1927. A former caretaker of the theater recounted incidents where he once saw a man standing on the stage—even though he was in the building by himself. Another time (when he was again by himself), he heard something up on the balcony and looked up to see a man standing in the front of balcony staring down at him. There have also been strange problems with light bulbs burning out—often ones that have been replaced just days prior—and other mechanical problems that can't be explained. The Dunhill is one of Uptown’s oldest buildings, which opened in 1929 as the Mayfair Manor. In one certain room, employees claim they get a strange feeling, just describing it as “something that runs up your spine.” The hotel did see several suicides during the Great Depression, as it was one of the tallest buildings the public could access, and several desperate people threw themselves from the roof. Charlotte Fire Station Number Four was built in 1925 and now serves as a fire museum. While it's not a functioning firehouse still, the building may still be the home of a firefighter named Pruitt L. Black. The station is open for touring, and people say they’ll sometimes smell cigar smoke, even though there’s no one around. On April 1, 1934, Pruett was heading out to respond to a fire. As he rushed to get ready on the second story of the firehouse, he headed for the pole to slide down. He tripped on his bunker pants, fell into the hole, and dropped from the top floor to the ground, fatally fracturing his skull. Some say his ghost is the one smoking a cigar on the second level. Now a historic site offering daily tours, the Latta Plantation was formerly the home of the Latta family, and some say they never left the site. Employees have reported that during tours, they’ll hear the sounds of children playing and running in the attic. In the actual family home, doors will slam shut on their own, and strange shadows can be seen in the late afternoon. While you may not be able to spot a ghost during a busy tourist day at the plantation, you can still get a great education on the lives of plantation owners and slaves in the ​backcountry of North Carolina at this historic reenactment site. Located in the aptly-named Spirit Square, the McGlohan Theatre now sits on the site of a church originally built in the late 1800s. However, the current building has been standing since 1903, and although it first served the city as a church, it was converted to a theater in the 1950s. Today, theater employees working in the basement have reported hearing faint singing in the theater above them, and have heard the sound of footsteps when the theater is closed and there’s nobody else in the building. Like most theaters in the United States, the McGlohan leaves a ghost light turned on in the center of the stage when no one is using it to keep the ghosts at bay. Founders Hall sits on the site of what was formerly Founders College. At the time, it was against the law for medical colleges to purchase corpses for anatomical research, so they sometimes had to resort to good old-fashioned grave robbing. The story goes that a young girl named Louise passed away in nearby Salisbury, and her body was transported here shortly after her death. Louise apparently didn’t appreciate her body being sliced into and analyzed by students, and she still visits the area from time to time. It is worth noting though, that the body of Louise has also been reported to be sold to the medical school at Duke University, where this same legend is told. Kennedy's Premium Bar and Grill was a former farmhouse a long time ago, and it appears that its residents may not have moved on from their days on the farm. Many hauntings have tragic stories that accompany them, and unfortunately, this one's tragedy is that the restaurant closed in 2018. However, you can still visit the site and perhaps catch a glimpse of a ghostly specter in the corner of the restaurant. When Kennedy's was open, employees of the restaurant reported hearing doors opening and closing and radios turning on and off when nobody else is in the building. CAPS (the Charlotte Area Paranormal Society) even conducted an investigation at the site in 2014 and determined that, in their opinion, the building is haunted. The campus of Queens University plays host to several speculated spirits, most of which were said to have been former students who ended their lives while in school. Albright Residence Hall is said to be haunted by a woman who committed suicide in the dorm. The door to the room where she lived reportedly flies open on its own, and students have heard someone or something knocking on the walls on the inside. Students in Wallace Residence Hall have also reported strange activity in a specific dorm, from cold spots in a corner room to strange clanging and knocking noises. The main courtyard on campus is allegedly haunted by the spirits of several Civil War-era soldiers. Students have heard screaming on the grounds and have seen an apparition of a body hanging from a tree. The first bar in Ri-Ra Irish Pub can be traced to Ireland in the early 1800s; the second back to the 1700s. Employees have numerous stories about cold spots in certain areas and visions of men in period dress walking around. Be sure to ask the employees about the alphabet written in chalk on the upstairs wall. You can enjoy a delicious meal or drink a tasty cocktail at either of these restored bars, but if you stay there too late at night, your drinking buddy might be a spirit from another era. At the intersection of 8th and Pine in Uptown Charlotte, you’ll find the Overcash House. Build in 1876, the house is said to be haunted by the ghost of a woman who broke her neck after she fell down the steps to her death. Much like the “ghost light” at many theaters, there’s a candle that burns all day, every day in the turret to provide light for her. Although the house is currently closed for tours as it awaits approval to join the National Registration of Historic Homes, you can still spot the light in the window and might even see the ghost there, too.